Dimensions 583' by 107'11" by 32'6"
21'9" (6.6m) underwater protection consisting of an inner 0.375" (10mm) cofferdam bulkhead, 1.125"+0.5" (29mm+13mm) main torpedo bulkhead, an outer 0.375" (10mm) torpedo bulkhead, and an outer torpedo blister. This was designed to withstand a 300 lb (136 kg) explosive charge. 1942: Conning tower removed and superstructure rebuilt. 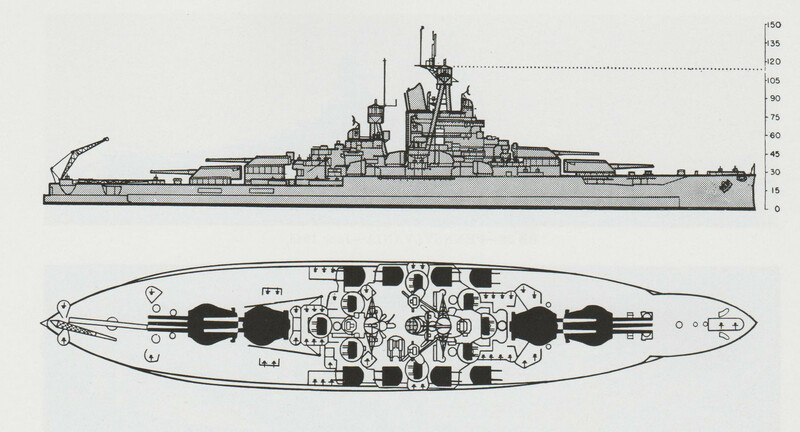 All 5" guns replaced with 8x2 5"/38 DP guns with 0.75" (19mm) STS shields. 8x4 40mm Bofors AA guns and 41x1 20mm Oerlikon AA guns added. 1944-11: Light antiaircraft increased to 10x4 40mm and 38x1 20mm guns. 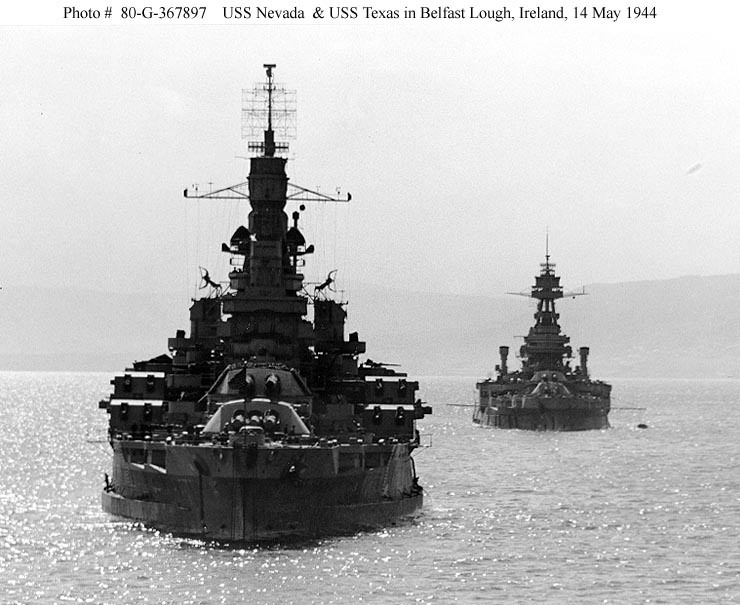 The Nevadas were completed in 1916 as the first of twelve "standard type" battleships completed before the start of the "battleship holiday" imposed by the Washington Treaty. Though these twelve ships were grouped into five distinct classes, they were quite similar in their general characteristics, which were optimized for long-range gunnery battles. All the ships displaced 30,000 to 32,000 tons, could steam at 20-22 knots, and had similar protection systems. The chief distinction between the classes was in the number and type of guns in the main battery. Protection. The Nevadas introduced the revolutionary "all or nothing" armor concept: Heavy armor protected the vitals, and nothing but splinter shielding was provided anywhere else. The ships had a heavy belt of Class A armor that was 13.5" (343mm) thick above the waterline. Starting about 2' (0.6m) below the waterline, the belt tapered to 8" (203mm) at its lower edge. The total width of the belt was 17'5" (5.3m).The side belt was joined fore and aft by armor bulkheads with the same characteristics as the main belt. Horizontal protection was provided by an armor deck that joined the top of the belt and bulkheads and was built up of multiple layers of Special Treatment Steel (STS) whose ballistic resistance was equivalent to a single layer about 2.4" (62mm) thick. Thus, the belt, bulkheads and armor deck formed an armored box surrounding the vitals of the ship. 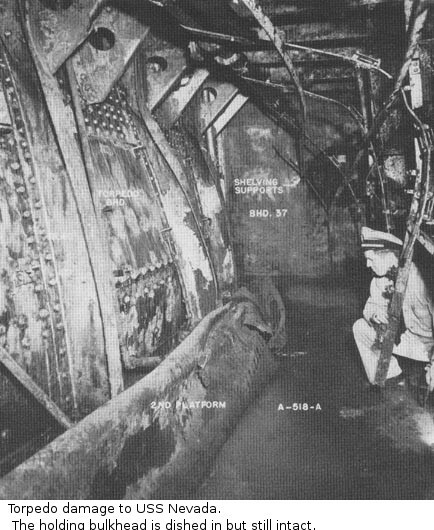 Underneath the armor deck was a splinter deck, which also served as the ship's main deck, and which curved down to join the belt and bulkheads at their lower edges. The splinter deck was built of layers of STS and nickel steel (NS) with a structural steel (MS) back layer, with a ballistic resistance equivalent to a single layer of STS about 1.7" (43mm) thick at its center and 3.4" (86mm) at its edges. The splinter deck was intended to catch splinters from shells that penetrated the belt or armor deck and burst in the space beneath. The steering spaces were protected by their own armor deck, composed of 4.5" of STS over 1.75" of structural steel. 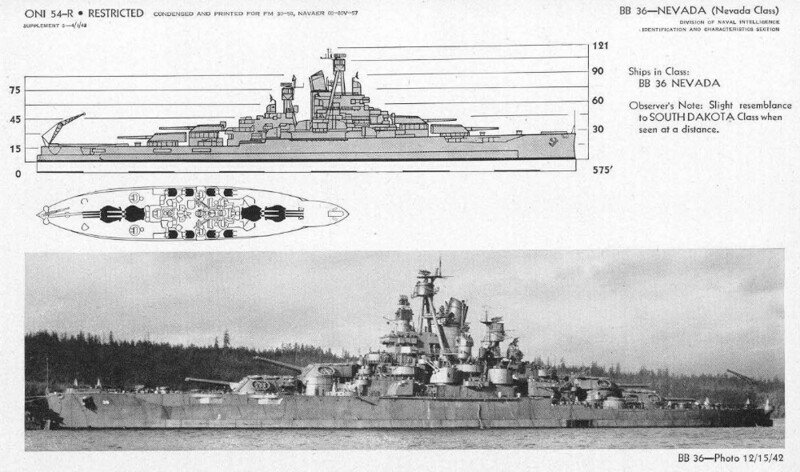 The main turrets had 18" (457mm) faces, 5" (127mm) roofs of STS, 10" (254mm) sides, and 9" (229mm) rears. The faces were very heavy to compensate for the inherent weakness of the three gun ports, while the heavy rear armor served in part to balance the turrets. The barbettes under the turrets, which extended down to the armor deck, were 13" (330mm) thick. The conning tower and uptakes were also armored down to the armor deck, the former being 16" (406mm) thick with a 5" (127mm) STS root and the latter 13" (330mm) thick. The secondary battery and their magazines were provided with splinter protection, as were the rangefinders. This armor scheme continued to be used almost unchanged for all subsequent classes of "standard type" battleships. It created a sensation among naval architects of other nations, whose subsequent designs adopted their own versions of the "all or nothing"armor scheme. Underwater protection was heavily debated by designers, who were concerned about the Davis torpedo. This was an unusual weapon that carried a short gun barrel firing an 8" (203mm) shell in place of the usual explosive warhead. A proposal to install a 5" underwater belt to protect against the Davis torpedo was rejected, which proved fortunate, since subsequent tests showed that such a belt was highly counterproductive against conventional torpedoes. Instead, the designers settled on a single 1.5" (38mm) STS torpedo bulkhead well inside the shell. Armament. One peculiarity of the design was the two-over-three turret arrangement, with the lower turrets carrying three guns and the upper turrets two. The use of triple turrets allowed the total number of turrets to be reduced, which in turn allowed the armor belt to be shorter and heavier. The decision to use triple turrets was bureaucratically risky, as the new turret design would not be tested until after the contract for the ships was actually signed. Fortunately, the design proved satisfactory, though there was concern over the fact that the guns shared a single pointer, so that a hit on one might disable all three. Testing did discover that the three guns suffered significant mutual interference, a problem that was solved by introducing a slight interval between firings. It was also discovered that interference was significant even between the two outer guns, which solved a longstanding puzzle over why the main battery of earlier battleship classes suffered from excessive dispersion of their salvos. Machinery. The ships incorporated some lessons from the earlier Delawares, including the value of fuel oil instead of coal. Nevada was the first U.S. Navy warship constructed with oil-fired boilers. Oklahoma completed with triple expansion piston machinery resembling those of Texas while Nevada completed with Curtis geared turbines. Modernization. The ships were extensively modernized in 1927-1929. 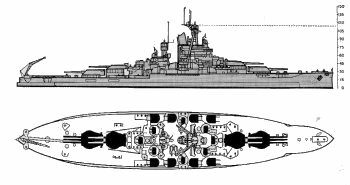 Horizontal protection was improved by adding another 2" (51mm) of STS to the armor deck, for a total equivalent thickness of 3.7" (93mm). Underwater protection was improved by blistering the hull, adding a 0.375" (10mm) cofferdam bulkhead in the boiler spaces inside the existing torpedo bulkhead, and adding a second 0.375" (10mm) torpedo bulkhead outboard of the existing torpedo bulkhead. A third skin was added to the hull under the boiler rooms. Nevada had her engines replaced with more modern Parsons geared turbines originally intended for battleships canceled by the disarmament treaties, but Oklahoma retained her original reciprocating engines. Both ships received more modern boilers. The ships received antiaircraft batteries of 5"/25 guns and 0.50 machine guns. However, in spite of modernization, the Nevadas were definitely obsolescent by the start of the Pacific War. 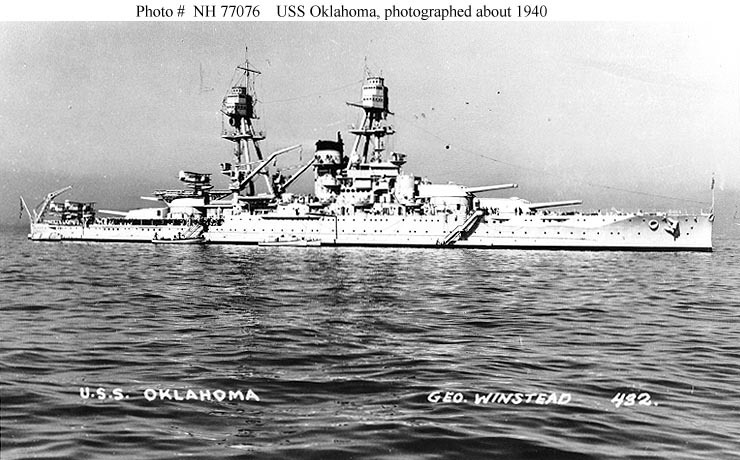 Oklahoma capsized at Pearl Harbor, and Nevada was beached in sinking condition after unsuccessfully attempting to escape from the harbor to the open sea. 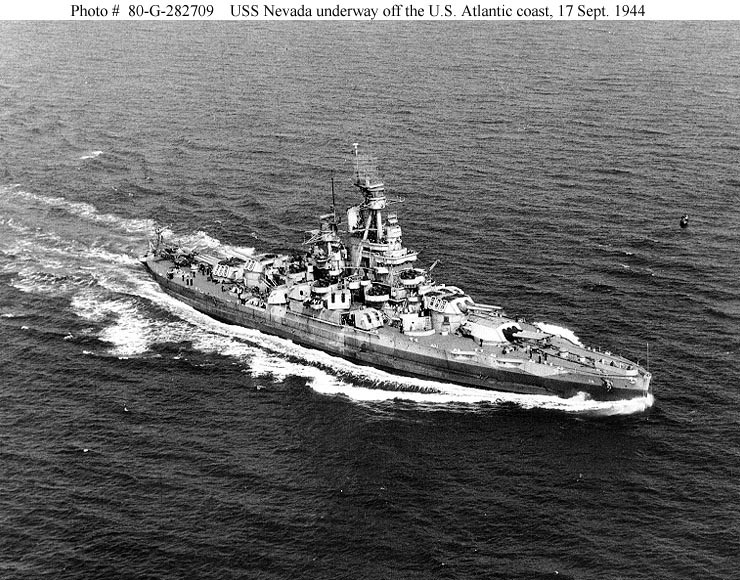 Nevada was hit by a single torpedo and should not have sunk, but she was in poor material condition, with numerous "watertight" doors and fittings that badly leaked; a fire started near her forward magazine by a bomb hit prompted an order to flood the magazine, which was misunderstood to mean flooding both forward and aft magazines; and her "Bull Ring" centralized ventilation system had been designed with inadequate closures, and when it flooded, the water was distributed throughout the ship. 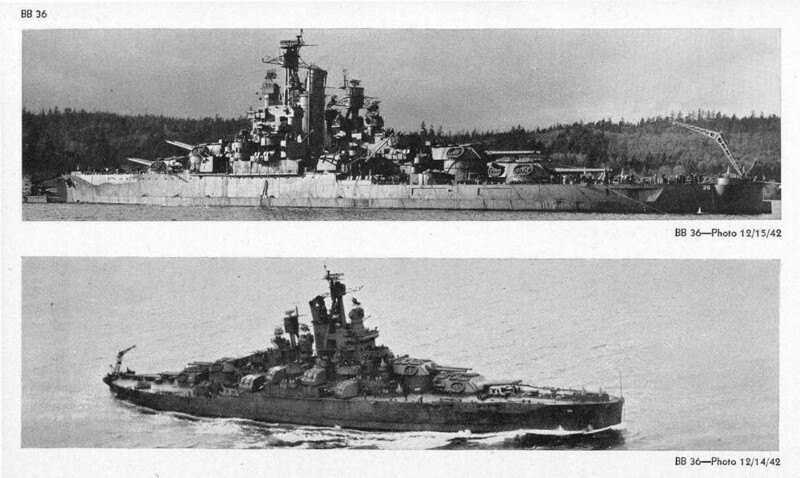 Nevada was subsequently repaired and and modernized, and she served in the Aleutians before being transferred to Europe for the remainder of the war. 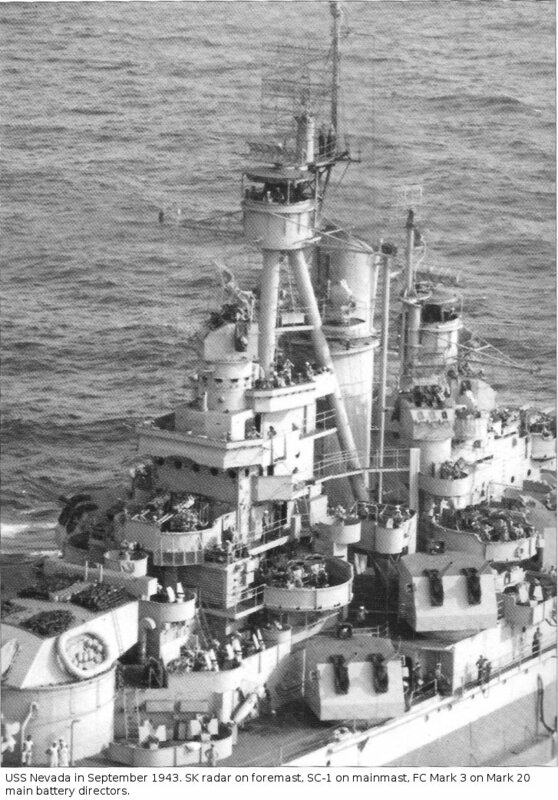 Oklahoma was righted during the war, mostly to clear the harbor, for the damage to her hull structure from capsizing was so severe she was not worth repairing. She capsized and sank while being towed to the mainland to be broken up in 1947.